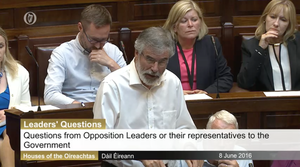 Sinn Féin leader Gerry Adams raised Nama’s controversial sale of Project Eagle again with Taoiseach Enda Kenny, calling, again, for a Commission of Investigation into the sale. 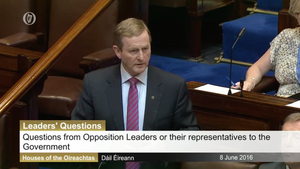 Posted in Misc and tagged Commission of Investigation, Enda Kenny, Gerry Adams, Nama, Project Eagle at 4:33 pm on June 8, 2016 by Broadsheet. Someone ask him why Noonan is going to Bilderberg? 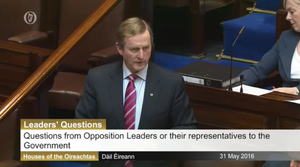 Whats that about Enda? Something tells me you have an answer to that already. jesus. whenever Kennys spoken words are written down it sounds like someone in a job interview who got asked a question they’ve no idea about and they’re tryin to waffle out of it and desperetely using long words to try sound like they know what theyre talkin about and to take up time while they try think, and ultimately not making any sense. he’s such such… SUCH a plank. And the FBI and the British will not be stone walled Enda and Baldie. A situation where the British and SF are on the same side and nobody bats an eyelid? Politics is a funny old game sometimes. The very idea that this was going on in the north and nobody in Dublin knew anything about it means they were at best, incompetent. This one is going to bite hard and the backlash will be something that makes Irish Water look like a tea party. That’s not true, Enda, as I am sure you know. 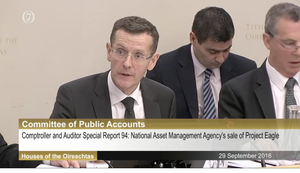 The Department of Finance, the Central Bank, the Special Liquidators of IBRC and NAMA are fully aware that NAMA has been overcharging interest on the loan book acquired from Anglo Irish Bank (which constitutes the major part of the NAMA portfolio) and that it has continued to do so despite a 2014 ruling of the High Court that such overcharging was illegal. See Pages 39 to 42 of the recent update from KPMG on the IBRC liquidation…. 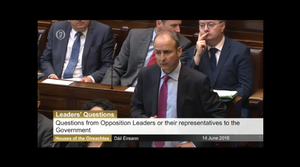 Have you repaid the €31.5mm you borrowed yet? I genuinely don’t think you’ll get much sympathy form people about the €100k you were overcharged when you defaulted on over €30mm in debt used to buy a load of investment properties in D6, never mind the €4.7mm you owe NAMA for your PPR. Andy, as you can see if you dig a little deeper, the judgment you refer to is listed for appeal in February 2017. The issue of fraud (and other relevant matters) has not been addressed to date. Why don’t Gerry or Mick Wallace reach out to the English crowd that are investigating project Eagle? or the SEC in the states? 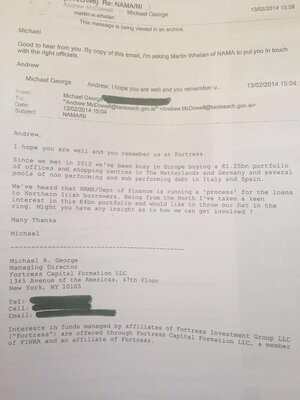 If they are investigating NAMA, they have some evidence and I suspect would want cooperation with Irish officials. That will happen in due course. The above-mentioned parties, and their legal and accounting advisors, principally KPMG, Arthur Cox and A&L Goodbody, have been accorded ample opportunity to sort out the various interest-overcharging frauds and have instead adopted the “head in the sand” approach. That they have done so on US loans, in particular, is quite extraordinary given the dim view of such matters taken across the water.